This article appeared in the October 2009 issue of Rural Policy Matters, a publication of the Rural School and Community Trust. Voters in Maine will decide next month whether to repeal the state law that forces many school districts to consolidate. At stake are common issues that plague consolidation mandates in other parts of the country, including whether or not consolidation actually saves money, who loses governance of their schools, and, of course, how the facts get spun. Greenlaw is Chairman of the Maine Coalition to Save Schools (MCSS), a political action committee that gathered 61,193 signatures in order to put the repeal question on the November ballot. The MCSS website www.repealconsolidation.com includes stories from districts dealing with the law. The consolidation law was championed by Governor John Baldacci and State Education Commissioner Susan Gendron, in large part on the claim that it would reduce school administrative costs. It was first passed in 2007 as part of the budget process after attempts to include it in the education bill proved too controversial. The law also cut state spending on education by $36.5 million by reducing aid to districts for administrative expenses, transportation, special education, and maintenance. 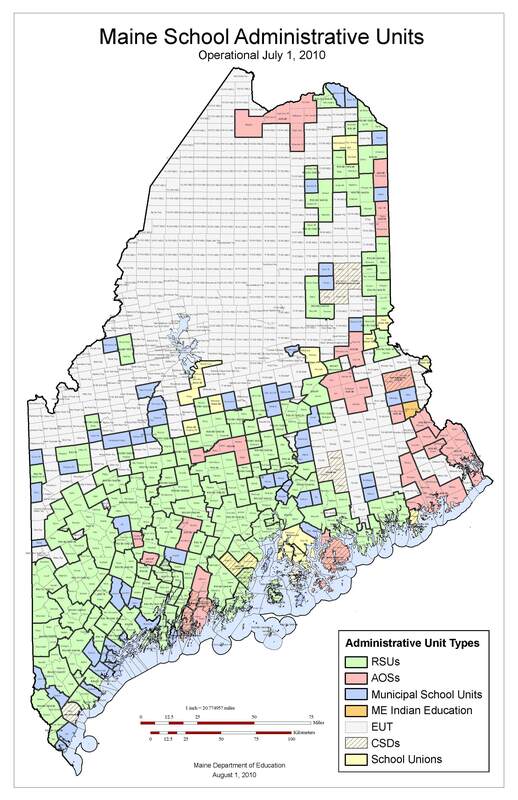 “System administration cost for Maine in 2007‐08 was 3.4%,” says Greenlaw. 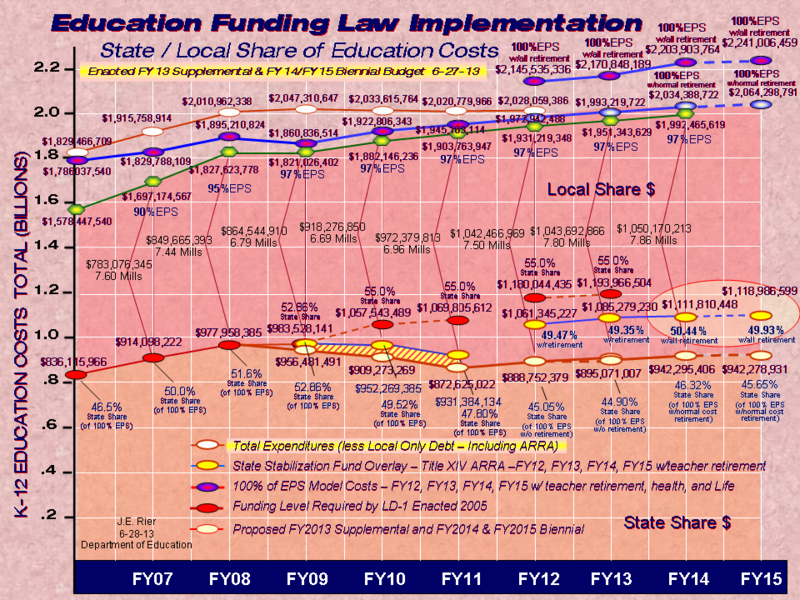 “The governor has already accomplished his goal of reducing the state’s share of aid to education by reducing the budget by $36.5 million in FY 08‐09 and he is about to announce a curtailment of $38 million in general purpose aid to education FY 09‐10. The consolidation law, as originally written, required all districts with fewer than 2,500 students to find other districts with which to merge in a Regional School Unit (RSU), a new type of school district created by the consolidation law. The goal was to reduce the number of districts in Maine from 290 to 80. Districts that failed to merge by July 2009 would face stiff penalties in the form of reduced education funding from the state. Greenlaw points out that 66 districts enrolled more than 2,500 students when the law was passed. That means that to get to 80 districts, the remaining 224 districts would have to merge into just 14 RSUs covering most of the state’s land mass. Opposition was fierce from the beginning and, implementation problems emerged almost immediately, problems more thorny than the usual confusions over new mandates. In an effort to make the law more palatable, the legislature amended it in 2008, changing the cost-sharing formula, and again in 2009 when it created a small number of exceptions for isolated districts. Penalties for not consolidating were postponed from July 2009 to July 2010 pending the outcome of the ballot initiative. Maine has a long tradition of local governance of schools, and voters must approve school budgets, local tax hikes for schools, and consolidation proposals, including the new Regional School Units. As in most states, districts have different local property valuations, tax rates and yields, teacher salary schedules, and levels of state funding pegged to local factors. But collaboration is not acknowledged under the consolidation law. Rather, merging districts must equalize salaries and replace local governance structures with new regional school units. Coming up with workable merger plans has proved nearly impossible in many places. Some districts can find no other districts with which to merge. There is little incentive for richer districts to share their wealth with poorer neighbors. Even districts that were already collaborating have often found it difficult to iron out all the complications of merging. Some consolidation committees have met for months only to end in frustration with no workable merger options. Voters in some 125 districts representing more than 200 towns rejected agreements reached by the consolidation committees, usually because costs associated with the RSU were even greater than the state penalty or potential savings. Approximately two-thirds of Maine communities that have voted on consolidation plans rejected them. So far, 98 of the 290 former districts have merged to form 26 new RSUs, leaving the state with 218 school districts, a far cry from the target of 80. In addition to the legislative exceptions, and the State Department of Education has approved alternative plans for 42 districts. Only eight of the 26 new consolidated units exceed the 2,500 student goal for an RSU. According to the State Department of Education, 85% of students now attend districts in compliance with the law. But the reality is that 55% of students reside in 66 exempt school units. That means the law is falling disproportionately on the most rural places, where consolidation makes the least sense and creates the most costs. The cost factor can be significant. For example, voters in the towns of Appleton, Camden, Hope, Lincolnville, and Rockport overwhelmingly rejected consolidation where the state penalty for not consolidating is estimated to be about $604,000. But costs associated with consolidating are estimated to be over $800,000. Either way, these small Maine districts face substantial reductions in state funding that will have to be made up with increases in local taxes. Tax increases are exactly what have happened in a number of rural communities as a result of their new RSU structures. In RSU 5, the town of Pownal has raised its taxes by 25% and the town of Durham by 19% to meet new costs associated with the RSU. In RSU 12, the town of Alna was forced to raise its taxes 33%, and the RSU has been unable to adopt a budget despite three attempts. has granted them exemptions to compliance with the state law. Governor Baldacci and Commissioner Gendron have continued to support the consolidation law and insist that it will save the state money. But Gendron told a state legislative panel that it was too early to determine whether the law had achieved any savings. Neither Baldacci nor Gendron will agree to a public debate on the matter, according to Greenlaw. A political action committee opposing repeal, Maine People for Improved School Education (MPISE), has also formed. The group, supported by the state Chamber of Commerce, has raised more than $300,000 to urge voters to keep the consolidation law in place. Most of that money has come from corporations, including L.L. Bean and Coca‐Cola, according to an October 23rd news 4eport in the Kennebec Morning Sentinel, which also reports that Governor Baldacci has acknowledged making fundraising appeals on behalf of MPISE. The group’s website, www.coststoomuch.com, makes a number of claims that seem misleading. For example, the site claims that the law reorganized more than 290 school administrative districts, but in fact many districts were granted waivers and experienced no changes. The website goes on to claim that if consolidation were repealed “money would be taken from the classroom to pay for administrative overhead,” although the repeal initiative makes no such provisions. Nor does the repeal initiative jeopardize “vital programs like AP course, Special Education, Gifted and Talented programs and foreign languages” as the website claims. The website asserts that although the number of school districts was reduced, “NO teachers were eliminated.” It fails to mention that the law prohibits laying teachers off in the first year after the RSU is formed and that teacher layoffs are sure to occur in many RSUs in the future. The MPISE website also misrepresents a Brookings Institution report, Charting Maine’s Future, claiming the report says the state would save $25 million through consolidation. The report does recommend consolidation, but the $25 million is what the report says Maine would save by bringing per pupil administrative costs down to the national average, not by consolidating. And, the county that the report uses as an example of excessive bureaucratic spending and duplication is not low wealth and rural. It’s Cumberland County, the state’s most populous and affluent. And that $36.5 million in state reduction to education funding? The website claims it as $36 million in “savings” and writes that repeal “would wipe out those savings and will make local property taxes go up much, much faster.” Even Gendron has admitted that repeal will not put that money back in the education budget. With all the waivers already granted, there is no way the state will reduce the number of districts down to 80. Those districts that have not been granted waivers, the ones that will have to shoulder the costs of the consolidation law as it stands, are rural, generally less affluent with lower property values and higher tax rates than the rest of the state. MPISE does not explain these facts. Greenlaw reiterates that the Maine Coalition to Save Schools is not against consolidation per se. It recognizes that some RSUs are functioning successfully, that many districts could well reduce administrative expenditures, and that Maine’s budget crisis will likely force cutbacks in spending. “The class size reduction measures of the 1990s were costly and the state as a whole has seen a decline in the number of students,” says Greenlaw. Further, he explains that a 2004 law requiring the state to fund 55% of the cost of education (the total state cost, not the state share of funding to individual districts, which would continue to vary based on local factors) is unrealistic. “The state has never met the 55% threshold and nobody expects it will,” says Greenlaw. But fears about the 55% requirement, if enforced, could mean hikes in state taxes may be fueling some of the opposition. MCSS supports allowing successful RSUs to remain in operation or to convert to a School Administrative Union (a group of districts that share administration) or a School Administrative District. “This law is too rigid,” says Greenlaw, who emphasizes that it flies in the face of Maine’s traditions of independence and self‐determination. The vote is November 3rd and early voting has already begun.